Did you know that Baxi not only offer free product training but also a range of unique specialist courses as well as accredited courses so you can gain the qualifications you need for your business? 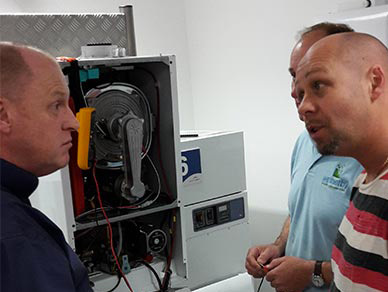 We have training centres all over the UK where our experienced trainers will help you get hands on with our boilers. You will be able to work on live boilers, get lots of hints and tips from trainers who have all worked out in the field and understand what your job entails every day. Our free courses give you no-nonsense training, from qualified Baxi trainers who know what the job is like. We will provide you with hands on training with the latest ranges of Baxi products at our state of the art training centres, several with CIPHE approval. Our courses reflect the work you do, giving you the skills to use the very next day. Remember – if you attend a free of charge training course and register a boiler on Baxi Works, you are eligible for a free listing on ‘Find an Installer’ on the Baxi website. Our specialist courses include Multimeter training, boiler diagnostics, combi boiler appreciation and system wiring and controls. Instruction is very practical, ensuring you leave with a thorough understanding of the subject. If you are a Baxi Works member you can also use your points to pay for selected specialist training courses. Please see the rewards catalogue for further details. 20% discount for Baxi Approved Installers! Don’t forget, if you are one of our Baxi Approved Installers, you can claim 20% off selected specialist training courses*. To receive your 20% discount, simply call Baxi training on 0344 335 4207, explain that you are a Baxi Approved Installer and quote your Gas Safe number. Full Baxi Works terms and conditions apply. This promotion is open to Gas Safe registered installers only, aged 18 or over, who are residents in the UK and who are a Baxi Approved Installer on the Baxi Works loyalty scheme. You will be eligible for 20% discount on any specialist training course you book with Baxi. Specialist training courses are: Unvented, Boiler diagnostics, How a combi works, Multimeter training, system wiring and controls. The 20% discount is available for any specialist training course you book, it is not limited to one use only. This offer is valid from January 1st 2017 to December 31st 2018. This offer does not apply to any other promotional offer. We reserve the right to disqualify any participant in the promotion who tampers with or abuses any aspect of the Works programme, or who fails to comply with any of these terms and conditions. Baxi reserves the right to withdraw or change this offer at any point without prior notice. Baxi is a trading name of Baxi Heating UK Limited. Your data will not be shared with third parties except those necessary to administer this offer. Employees of Baxi or its parent company, their immediate families or anyone else connected with the promotion, are excluded. The promoter of the offer is Baxi Heating UK Limited, Brooks House, Coventry Road, Warwick, CV34 4LL. The promoter's decision is final and no correspondence will be entered into. "I’ve recently come back to heating and plumbing after twenty years as a teacher, and boilers are very different today! Having retaken my Gas Safe qualifications, I wanted to update my skills. A friend asked me to fit a Baxi, and while looking it up online, I found this three day course. It’s been very helpful and informative. I can honestly say it’s the best manufacturer run course I’ve been on. Graham’s really good at explaining in an easy to understand way, and shared lots of helpful tips. I want to be able to give my customers better value for money and this course will help me to do that." Our mobile app enables you to scan the boiler promotional barcode and register the warranty and Gas Safe notification quickly and easily when you’re on the go. It's easy to join and you can start reaping the benefits for your business straightaway and collecting points to spend in the rewards catalogue.